Use rain gutters from Home Depot or Lowes, or your local hardware store to make the perfect reading nook for your little ones' room! Or even better - be really frugal and simply recycle your used ones when your gutters (or your neighbors) get replaced. Simply sand the old gutters down and repaint. One 10 ft vinyl rain gutter will cost under $5, and the caps (at each end of the shelf) can be bought as cheaply as $2.50. 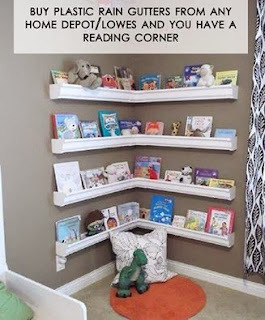 So for less than $10 per shelf, you could create a trendy reading nook for your little ones! -- use a leveler to make sure they come out straight. Then screw them into the wall! That's it! NOTE: use vinyl not aluminum gutters, so no sharp edges. Cristal commented: Funny that you tagged me in this. You know me well. I actually have had these in my classroom for years under the whiteboards. They are great. I display current books for science, social studies, math and more there. They love them. Christy suggested: This works great for rolls of ribbon, vinyl, etc. Vickie suggested: Cool idea...you could spray paint them any color too!! Denise suggested: Also for closets and inside cupboard doors and garage/attic/basement. On the back wall of kitchen counter for spices, teas, coffee etc. Drill drain holes and use on shower/ bath wall. As a bird feeder attached to windowsill so you can watch the birdies. As window boxes for plants, and in the craft room. April suggested: I could see this as a great pantry idea as well. Sandra suggested: This would work well for books well for a homeschool learning center also. Lorrie suggested: I did a long gutter at the top of my wall and put stuffed animals on it. I loved this idea. Tonda suggested: That is an awesome idea for books, spices, anything! Roxanne suggested: Also great for displaying photos.